F2 is where full time school starts at Athersley South. We currently have 40 children on roll with two teachers, two full time and one part time nursery nurses. We are housed in the same building as F1 (our 3 and 4 yr olds) but we have a separate classroom. We join the F1 children during outdoor learning and activities. Please use this page to find out all about how our interests have been extended and built uponeach day by the staff. The children have had lots of super fun playing I spy using UV lights. They have been using their knowledge of letter sounds from Read Write Inc to read words and find the right picture. For an extra challenge the children took turns to choose a picture and then write the secret word on a piece of paper with the magic pen. Miss Pell and the other children then had to read the secret word and find the matching picture. Last week we introduced and developed our children's understanding of money. Today the children and Miss Pell created a snack shop... with real snacks! The children helped Miss Pell sort the real coins and made labels using their phonic and number knowledge for the snacks and how much they cost. The children really enjoyed using the different coins to buy our real snacks and used lots language around number and money. They cannot wait to come back tomorrow. Keep an eye out for more learning taking place in our snack shop. 10.3.17 - We have had a lovely week outside building dens, princess castles, Sauron towers and houses. We have been working together to develop spaces by listening to each other and solving problems on how to create our ideas. 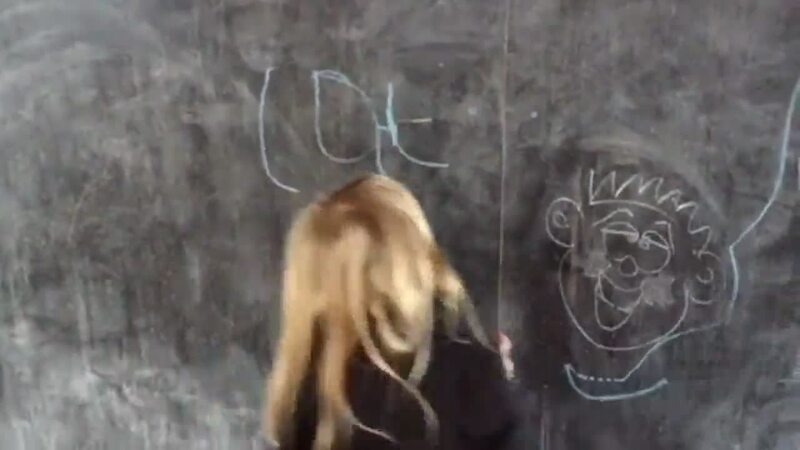 Once the children created the spaces their imaginations grew which went on to writing rules, signs and pictures. This week we have been reading the story of 'Mr Wolf's Pancakes' by Jan Fearnley. To celebrate World Book Day and Pancake Day the children worked together and created their very own pancake shop. We made order forms, price list and followed the recipe with Miss Pell just like in the story. We also used real money in our shop and the shop keepers applied their number skills when adding amounts and giving change. We had lots of fun working together, role playing, making and eating the pancakes. Look at our fantastic writing, We have been using our Read Write Inc skills to write captions and sentences outside. 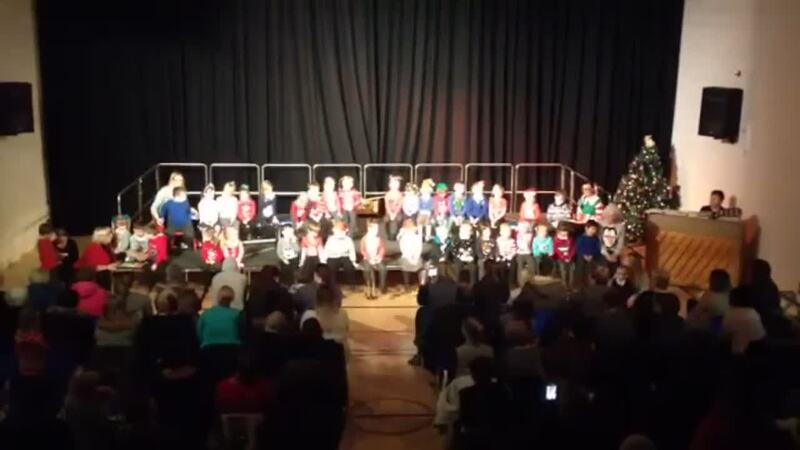 On Tuesday morning F2 performed at our 'Festive Sing Song' for all the mummies and daddies. We had so much fun singing our songs whilst wearing our Christmas jumpers. We hope you all enjoyed it too. Below are some clips of our amazing singing. Mrs Hale, Miss Pell, Anne (Mrs Brown), Alison (Miss Rushworth) and Miss Ellis would like to wish you all a very Merry Christmas and a Happy New Year! 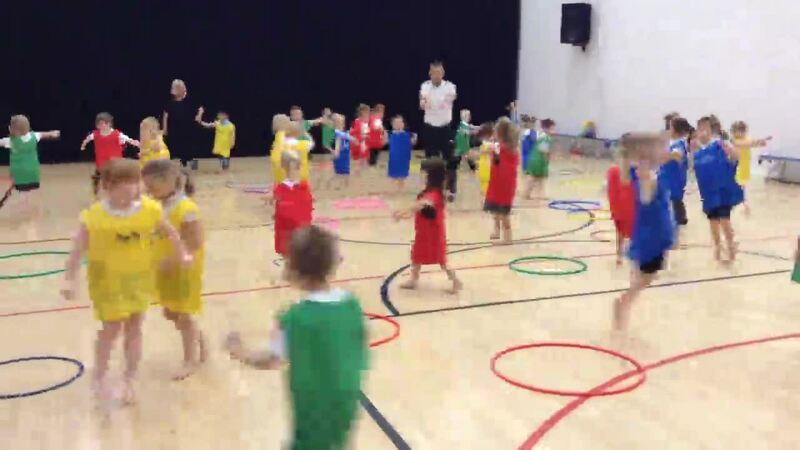 F2 have had so much fun in PE with Mr Gorner. We have played lots of exciting games and we have to listen very carefully to his instructions. Remember our PE is EVERY Wednesday so please make sure your child has a kit at school. Meet our new class members Bobby and Bertie. At the end of each week our class bears will go home with one of our children. We can not wait to hear all about their adventures with the children outside of school. On Wednesday the children were very excited when they saw the apples growing on our tree outside and that we could eat them! There were lots and lots of apples that we picked (we counted 29 all together) so the children decided that they would like to bake an apple crumble, some children said that they have it at home and it is really yummy. We first started by washing our apples and then chopping them and putting them in to a pan of water. (Miss Pell did lots of talking about keeping safe when using knives) Miss Pell then cooked the apples to make them nice and soft. Once the apples cooled we put them in a tray and poured apple crumble mix over the top and then put it in the oven.The children were very excited to try the crumble that we had made from the apples in our garden. We can certainly say that the children really enjoyed baking and most importantly eating! If you would like to make an apple crumble at home please click here for the recipe. We also did a little experiment with one of the apples. We chopped two pieces up and put one in water and left the other one on the table. Can you guess what happened? Ask your child to see if they can remember. Today we have been exploring outside in our mud kitchen. The children tried really hard to get their wetsuit coats, trousers and wellies on al by themselves. Once we were ready we went in to our mud kitchen and we explored dry and wet mud and played imaginatively using different materials, herbs and seasonings... Some were very smelly! The children made buns, bread, soup and scrambled eggs and we also made some recipes, thinking about the sounds in the words. The children all enjoyed talking about what they made at home with mums, dads and grandparents. Some children also set up an apple stall with all the crab apples that have fallen from the trees and you could buy one for seven pounds!! The children went exploring in our garden and noticed that our apple tree had some delicious apples on, so we picked the best apples, washed them and had a taste, they were scrummy. Watch this space for yummy apple crumble. A big warm welcome to all of our children starting their first year at full time at Athersley South Primary School. We cannot wait to meet you, get to know you and be a part of your new learning journey. Our Trip to Yorkshire Wildlife Park! The children have been very interested in learning about animals. To help our learning we have used information books, internet to find out facts and a trip to the Yorkshire Wildlife Park. The children were very excited to see all the animals. We saw polar bears, lions, lemurs, otters, tigers, emu, wallabies and our favourite the ant eater who was very very big! We all had a fantastic time and the children were brilliant with their listening ears and good choices. Well done F2's. We couldn't forget about caring for our seeds and plants during Arts week and just take a look below what has happened to our seed experiment. It rained a lot on Friday and we thought it would be a good time to plant our beans outside. We carefully removed the seeds from their mini greenhouse. Some of them had lost their seed coat as they had grown. The children made lots of interesting comments and asked some good questions- can you help answer any of them? How could we find out? "Wow now they are really big like a real beanstalk"
"Look why do they have lots of little roots on that big one?" "Why do they need a seed coat?" "Look the root gets bigger when the plant does"
"Yep that's because when it gets bigger it needs a bigger drink"
"Can they carry on growing without soil?" The children thought they were too big now as the shoots were popping out of the top of the green house. We decided to plant them in the garden and we will keep posting pictures of them. Ahoy me hearties it's Arts Week! This week is Arts Week and the children have been very busy in F2. The theme for this year is .... Pirates! The F2 children have really enjoyed creating, making, building and using their imaginations about pirates. Inside the children have been super busy building on their original pictures to make them stand out, as well as building and writing. The children have been really interested in finding out facts about animals and creatures that live under the sea and we used information books and the internet for help. The children then created their favourite under the sea animal/creature using oil pastels. We then added blue water paint. This technique is called resist paint as the paint resisted the oil pastel...magic! Once the paint had dried the children built on their picture by using different textures and materials. When you walk through school keep an eye out for our amazing work, fabulous facts and stories we have written. Each year our school hosts an amazing show and every child gets involved. The children create the set, the costumes and of course they act, dance and sing. This year our show is about Pirates (we can't say anymore than that- we're sworn to secrecy and we really don't want Mrs Gollick to make us walk the plank!) Outside this week F2 have been using lots of different resources to create and build their own pirate ship. We had so much work to do that we ran out of time- so keep an eye on our page as we will be posting more Pirate artwork next week. Have a peek in our little green houses and take a look at our bean seed experiment. We were so excited to find that the seed coat has split open and we can see the root, we took a close up picture on the ipad for you, can you see it too? Our seeds are also growing. We planted cucumbers, cauliflower, beans, carrots, strawberries, water melon and flowers. The first seeds to grow were the cauliflowers they only took 3 days for the shoots to appear and they had quite small seeds, so the biggest seeds don't grow the fastest. The bean had the biggest seed and that sprouted last but so far it is the tallest- we are using the ruler to measure it. Lots of collaboration and team work this week in the construction area. Looking at non-fiction books led to a discussion about how we help to look after animals. Have a look at Maxi the dog and the things he needs to keep him safe and healthy. Fantastic work F2! Do the biggest seeds grow the biggest plants? Do the biggest seeds grow the fastest? Can a seed grow without soil? Watch this space to see what happened when we started our experiment to find out and what happened when we planted our seeds. This week we have been looking at the environment around us. The children noticed lots of changes in our garden. Our plants and flowers are starting to grow, new buds on trees and some children spotted birds in the trees and in their nests. This sparked lots of interest in looking after the animals in our environment. Some children made bird feeders at the sticky table inside and some children made nests outside, we also made sure that the birds had some seeds to eat and a bird bath to keep them nice and clean. Have a look at the nest three of our children made by working together and thinking of what would work best to keep the nest in the tree and comfortable for the birds. Keep a look out for more exciting pictures about looking after the animals in our environment. We have been so very busy in F2 this week we have been reading magazines and finding out all about non-fiction books, there is even a special shelf for them in our book corner. We have been combining media and materials to create models and pictures in our creative and construction areas. We are very interested in designing and making robots at the moment. WOW what an amazing week of learning from message to Mummy writing to castle building. We hope you all have a safe and Happy Easter and we look forward to seeing you all after the holiday when our 'Robots' theme will begin. March 2016 - The children have been very interested in planting so this week we have been digging soil, moving it to our new planting bed and making it just right for our peas. We found lots of worms and roots, the children enjoyed looking, feeling and finding out about the importance of roots and the special job they have. The children also made new homes for the worms in the other beds and we found out that worms like dark and damp places like under the ground or in the soil. This week we have been looking at the Enormous Turnip story. The children have been pretending that the dead sunflower stalk was stuck so the children pretended they were characters in the story. The children pulled, tugged and heaved the plant until it came out and they all fell to the floor just like in the story. We then pulled all the weeds and dead plants out of the bed to get it ready for our turnip seeds. We hope our turnips will be as enormous as the one in the story. Just look how busy we have been today! After drawing a picture we extended it by using speech bubbles to show what they were saying. All the words were written to match how they sounded, which can be a very tricky job. Well done! During 'It's Nothing New' in big Maths this week we found out that once you know your Learn It's you can add all sorts of numbers together. If you know what have a look at the picture below, this came from a discussion about which Learn It's we already knew. If you know what 1+1 is, can you work out what 10+10 is? and what about 100+100? this is what we discovered......Just because they are bigger numbers it really is nothing new! We enjoyed finding out which classroom objects our magnets would stick to, have a look at some of the things we found were magnetic. We found out that wood and plastic are not magnetic but most metal things are. Wow what a week exploring, discovering and finding out. The Autumn season is upon us and the leaves are filling up the ground- but what happens when you drop different objects into puddles... Well have a peek! Take a look at the special visitor that came to see us this afternoon. We can hear sounds, blend them together to hear words and we can write the words- WOW! Just take a look- F2 have been writing everywhere this week, numbers, letters and creating super hero pictures. We are very proud of you! This week we have been looking after our environment and working together. The children have been super busy feeding birds, tidying up and looking after our garden. The children enjoyed looking at different things in our environment and talking about them. We have a bird watching window in our classroom and we have been very excited to learn about some of the common garden birds that we can see everyday. There are some fabulous video's and interesting bird facts in the Early Years section of the RSPB website click here: RSPB Early Years to use them at home. The children have been thinking about ways we could encourage more birds to come to visit our school grounds and they have placed a bird feeder outside to observe. Look out for it on your way into school and happy bird watching. 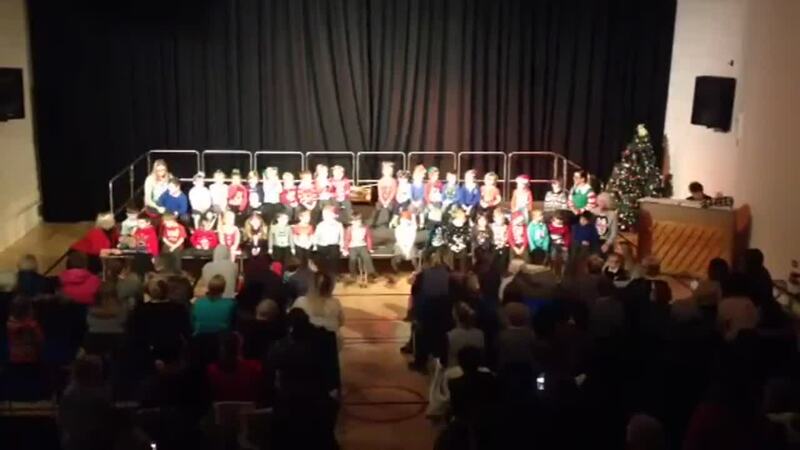 Click on the videos to see and hear some of the children's amazing singing, dancing and music making.